Starring: Chris Pratt, Zoe Saldana, Dave Bautista, Vin Diesel, Bradley Cooper, Michael Rooker, Karen Gillan, Pom Klementieff, Elizabeth Debicki, Sean Gunn and Kurt Russell. The more I think about Guardians of the Galaxy Vol. 2, the more I like it. When James Gunn gave us the first film, it took many people by surprise, including myself. People were won over by the colourful visuals, the irreverent tone, the catchy 80s soundtrack, and just the pure fun of it all. It was the most ‘un-superheroe-y’ (for lack of a better term) superhero film I’d ever seen. It had more in common with Flash Gordon than The Avengers, which is probably how it wormed its way into so many people’s hearts. It’s very much the same case with Guardians of the Galaxy Vol. 2. It keeps the same tone, the same visuals, has, in my ears, an even catchier and more relevant 80s soundtrack than the first movie, and it’s just a heck of a lot of fun. Yet, with his sequel, Gunn has cranked everything up a notch. The action is bigger, the film’s scope is huge (one of the characters is literally a living planet), and we get more character development in Vol. 2. We learn more about characters like Rocket Raccoon, Yondu, Nebula, Drax, and even Peter Quill himself. 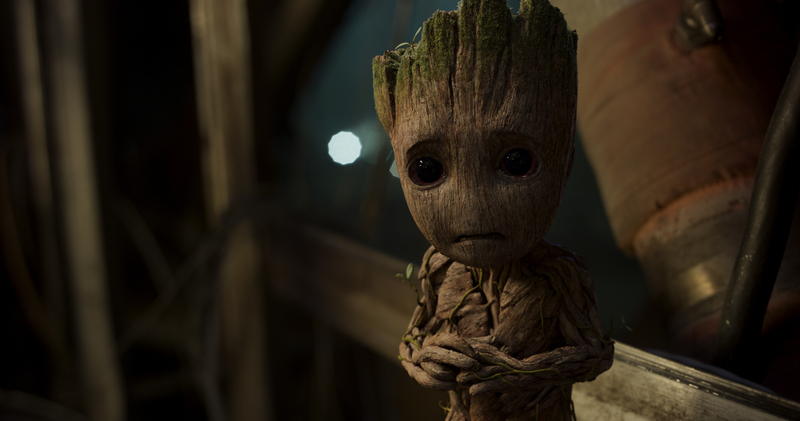 Isn’t Baby Groot just the cutest baby tree you’ve ever seen?! Vol. 2 takes place quite soon after the last film. We meet the Guardians on a platform attempting to protect valuable batteries from an inter-dimensional octopus, called the Abilisk. 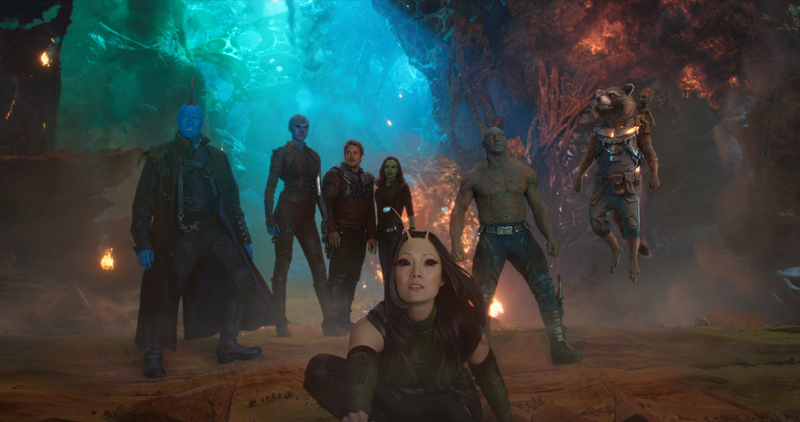 Once the monster has been split open (yuck), in one of the most amusing action scenes I’ve seen in awhile – it involves the Guardians desperately trying to kill this monster whilst Baby Groot is dancing around to ELO’s Mr. Blue Sky – we learn that the Guardians have taken on this job in exchange for Gamora’s estranged sister Nebula. Unfortunately, Rocket just couldn’t stop himself from stealing a few of the batteries they were hired to protect, which really pisses off Ayesha (Elizabeth Debicki), leader of the Sovereign race, and results in a great big fight in space between the Guardians and the Sovereign’s fleet of drones. 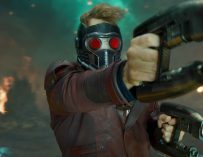 Luckily for the Guardians, Ego (Peter Quill’s father played by Kurt Russell), was on hand to help them out, which reunites Star-Lord with his long lost dad, who turns out out to be a god (with a small ‘g’). Peter Quill (a.k.a. Star-Lord) is looking for his dad! Yeah, I guess – Yeah, I feel a general unselfish love for everyone. The Guardians of the Galaxy vehicle is unlike anything else in the Marvel Cinematic Universe. The Guardians themselves aren’t really superheroes per se. They are capable of doing pretty extraordinary things, but this franchise isn’t about individuals with superhuman strength. It’s more about misfits coming together and becoming a family. I’d say that the Guardians are far more interesting than the Avengers. It feels bizarre to say it, but they’re much more human, even though Peter Quill is the only human among them, and he’s only part human. As I mentioned above, Guardians of Galaxy Vol. 2 is a lot of fun. I’ve been reading quite a few sniffy reviews about this film, and my answer to them would be, “Don’t you enjoy fun?” I was smiling from beginning to end, from the very moment I saw an aged down Kurt Russell. How could you not be won over by the characters? How could you not find Baby Groot unbearably adorable. 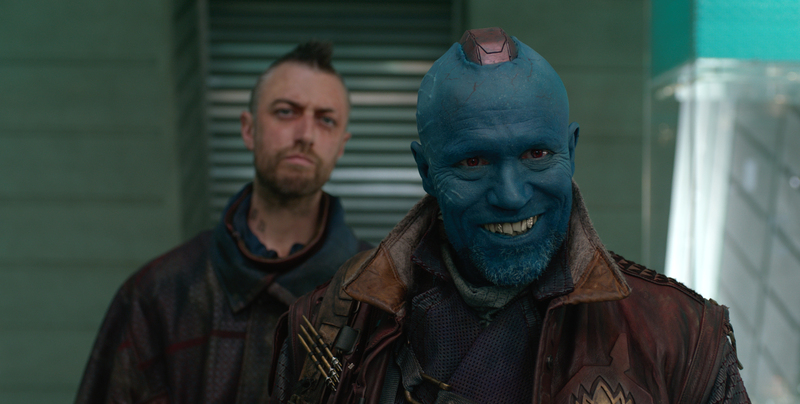 I would say that Groot steals the film, if it wasn’t for Michael Rooker’s performance as Yondu. James Gunn has said on multiple occasions that this is Yondu’s film, and I’d have to agree. We learn so much more about his backstory and his real motives behind keeping Quill around as a child. He also develops a fascinating relationship with Raccoon, voiced by Bradley Cooper. 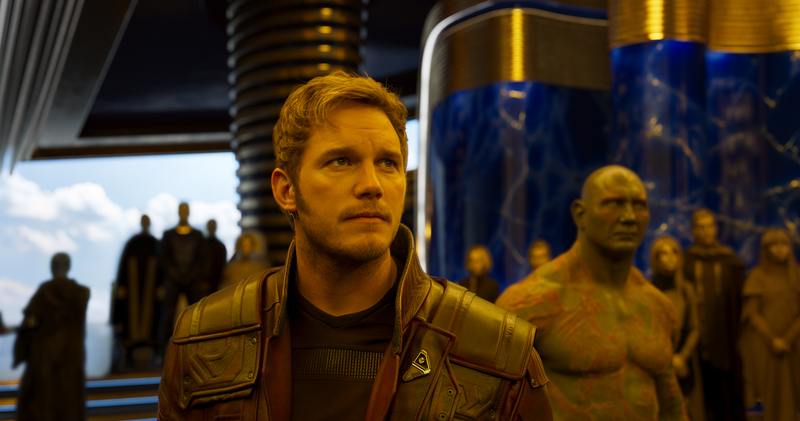 The two of them, along with Baby Groot, have their own story arch, which eventually collides with that of Peter Quill and co. who are on Ego’s planet. Yet, we also get to see more of Nebula (Karen Gillan) and Gamora’s (Zoe Saldana) relationship. We learn why Nebula is the way she is, and her story is a particularly harrowing one. And we can’t forget Dave Bautista’s Drax. He was one of the big surprises of the first film. 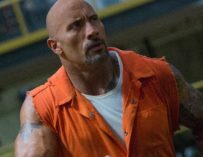 I for one was rather perplexed by his casting, yet he’s proven, much like The Rock did before him, that ex-WWF stars can act and have a place in Hollywood. Bautista is not only the perfect embodiment of Drax, yet his comic timing is virtually unrivalled, and he’s having to fend off stiff competition from Chris Pratt’s Quill and Bradley Cooper’s Raccoon. 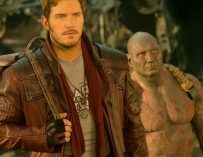 There was only one joke of Drax’s I found to be slightly misjudged, which involves calling someone ‘ugly’ on multiple occasions, but apart from that, Bautista’s Drax had me constantly chuckling. After coming out of the screening, someone made an interesting observation about the movie. This person likened it to a catchy pop tune. You enjoy it whilst you’re listening to it, but your enjoyment of it quickly fades a short while after hearing it. I do understand this sentiment towards a lot of Marvel’s movies; they’re really good fun whilst you’re watching them, but quickly forgettable. Yet, this wasn’t the case for me with Guardians of the Galaxy Vol. 2. Much like James Gunn’s first film, Vol. 2 has really stayed with me. I keeping on thinking back to certain scenes, listening to the soundtrack on Spotify, and I’ve even found myself watching interviews in which Kurt Russell explains how he was aged down using makeup and not CGI (incredible!). Maybe I’ll get tired of Guardians of the Galaxy Vol. 2 after having viewed it a couple of times. I’ll get back to you on that one after I’ve seen it for a second time.